Autonomous drone delivery is one of the hottest topics in the modern drone industry – and even outside of it! Whether it’s the failed Amazon drone delivery proposal, Uber Eats’ insanely ambitious three-year plan, or any other high-profile project, everyone wants to know which company is going to be the first to take drone delivery into the mainstream. 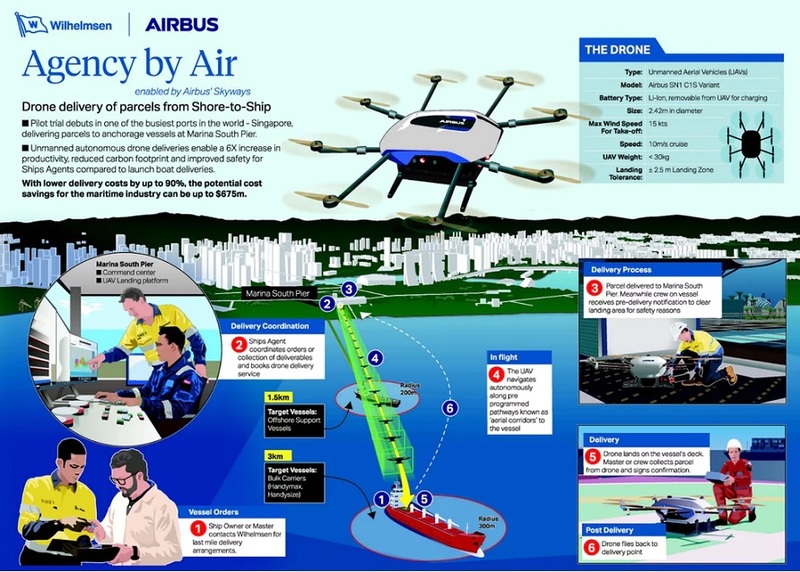 According to Airbus, the drone took off from a Singapore pier carrying a 1.5 kilogram (3.3 pound) parcel of 3D-printed objects of various sizes. It then flew autonomously (that is, without any user input) 1.5 kilometers (0.93 miles) to a ship which was anchored offshore. It then flew back to its starting position, again without user input, with the entire journey reportedly taking no more than 10 minutes. The promise of the world’s first autonomous shore-to-ship package delivery is definitely more exciting than the practical reality. Many questions remain – chief among them, whether or not such a delivery is possible to a ship that’s actually MOVING. And according to Airbus’ statement to AFP, the limits of the drones they are currently using to test this procedure are 4 kilograms (8.8 pounds) of cargo and a flight distance of no more than 3 kilometers (1.8 miles) from the coast. This could severely limit the effectiveness of such a delivery. However, Airbus’ Skyways lead, Leo Jeoh, told New Atlas that “Today’s accomplishment is a culmination of months of intense preparation by our dedicated team, and the strong collaboration with our partner, as we pursue a new terrain in the maritime industry.” Airbus says the technology has three major benefits. Firstly, it’s six times faster than regular shore-to-ship delivery. Secondly, a fleet of drones flying in autonomous corridors could lower delivery costs by up to 90 percent. Thirdly, flying a drone is safer than the alternative, mainly due to the risk of accidents which are known to occur through typical loading procedures in busy ports. And finally, carrying out deliveries with drones instead of with a smaller vessel will significantly reduce Airbus’ carbon footprint, in accordance with the European Union’s stricter guidelines for such things. The remaining Airbus trials – which are being carried out in partnership with Wilhelmsen Ships Services – will explore the full capabilities of the drones being used, as well as exploring other ways that unmanned aerial vehicles can be used to improve safety and efficiency in the shipping industry. The company has not yet reported what the final version of this autonomous ship-to-shore delivery service might look like, nor have they discussed any matters of pricing. Only time will tell whether this venture will yield future rewards for the drone industry or whether this test will just become a footnote in another failed experiment like the Amazon proposal. What do you think? Have you ever worked with Airbus’ previous UAV initiatives? Do you see a future for drones in the shipping industries? Will we ever see an autonomous ship-to-ship drone delivery? Be sure to sound off in the discussion below.